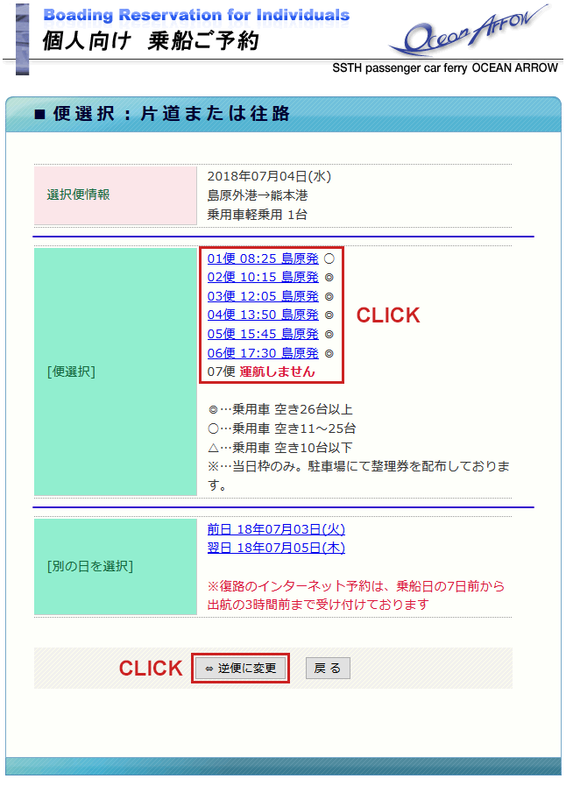 Information about High-speed car ferry "Ocean Arrow"
Accepting reservation begins from a month before the departure day, and ends at 3 hours before the departure time. Make reservation by PC, smartphone or tablet PC. The input of the mobilephone number is necessary. No reservation is needed. 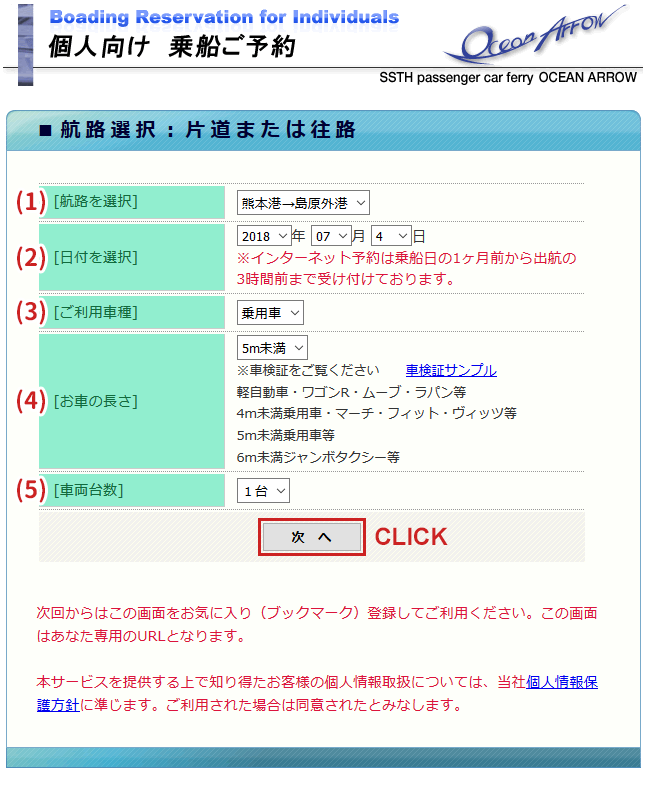 Please purchase your ferry ticket within ten minutes before the departure time. Please line up in the parking lot with your motorcycle or bicycle at the terminal. Our staff member hands you a Numbered slip. Pass the slip to the clerk at the ticket counter upon purchasing a boat ticket. And send a blank email. 2. 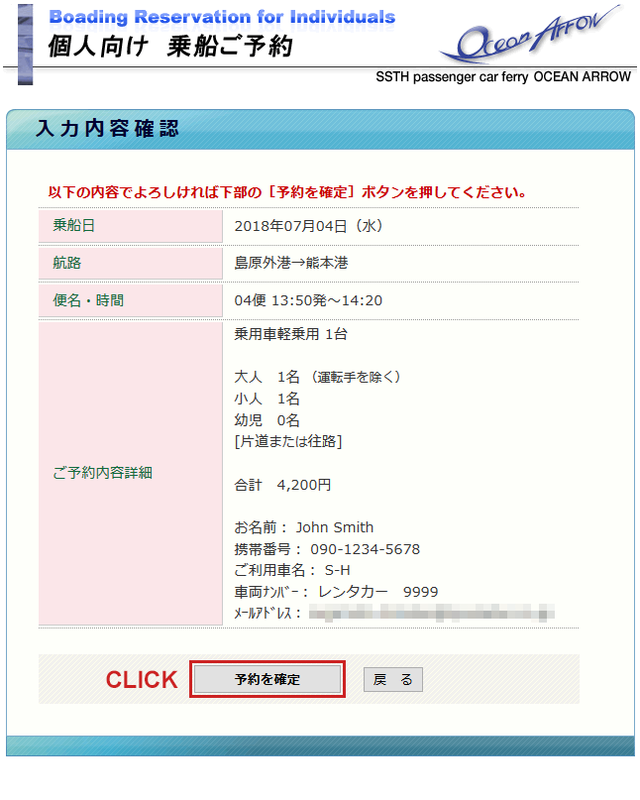 Receive the email including the reservation URLs from us. Access the URL listed in the email within 24 hours, and we authenticate you. 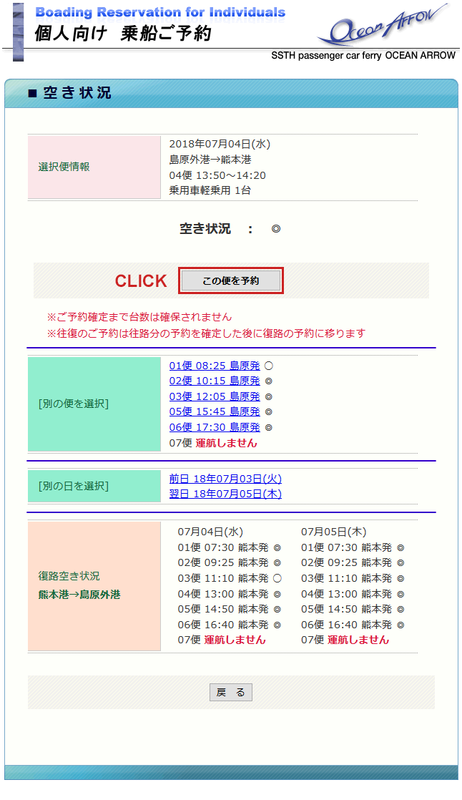 After the reservation finished, your phone number at the time of the reservation will be used for the next access. 3. A screen changes with your choice. For example, route, date, departure time, and so on. Make reservation along screen transition immediately. Click the button, and send a blank email. After a few minutes, the reply email will be send to you. Access the URL page listed on our email within 24 hours. Click the second URL for PCs and smart phones. means "From Kumamoto to Shimabara". means "From Shimabara to Kumamoto". Select the date from today to the day after a month. After filled in, click the button. Sellect the departure time you want, and click it. Status of reservation is shown by the following decorated letters. × :not acceptable. Get in line with your car on that day. If you want to change the route, click the button. 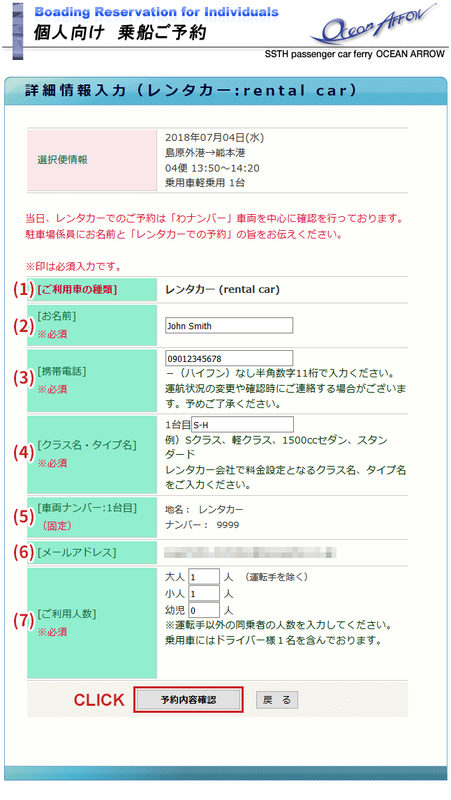 The status of the reservation you has chosen is displayed. Please click the button after confirmation. 11 digits by 0 to 9. No hyphens. For imergency call. 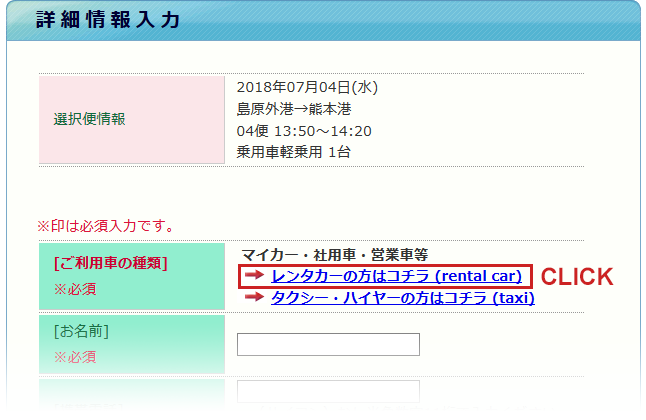 * Classification of your rental car company. :junior high school age and over. Exclude a driver. :not reached the age to enter an elementary school. And the reservation has been confirmed. 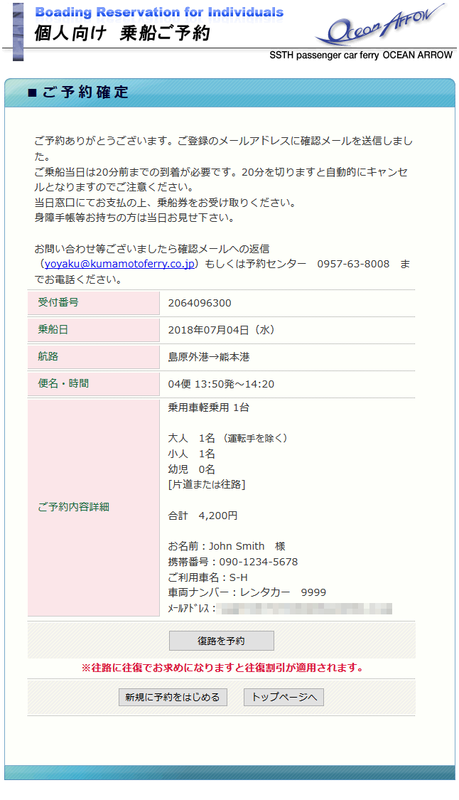 Check the email of the reservation from Kumamoto ferry. 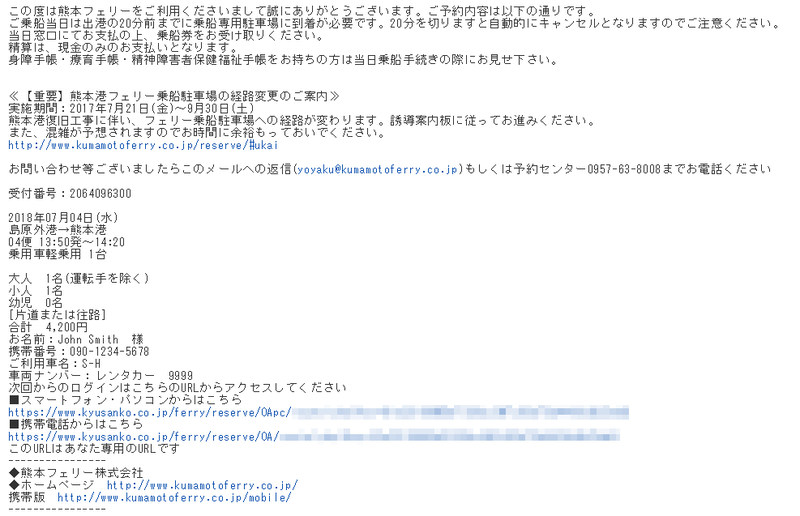 If you do not receive the email, your reservation is not accepted. Please be at the terminal 20 minutes prior to departure. If you were not there, the reservation is canceled. To purchase ferry ticket, go to ticket counter #2 inside the terminal building. And show this email and pay by cash. Have a good trip in Japan!